Although James H. McKenzie joined a career that had a positive and profound impact on his life, his early experiences of labour, on the other hand, were of a gruelling reality. James was initially put to work as a cow-keeper by his uncle at the young age of thirteen. 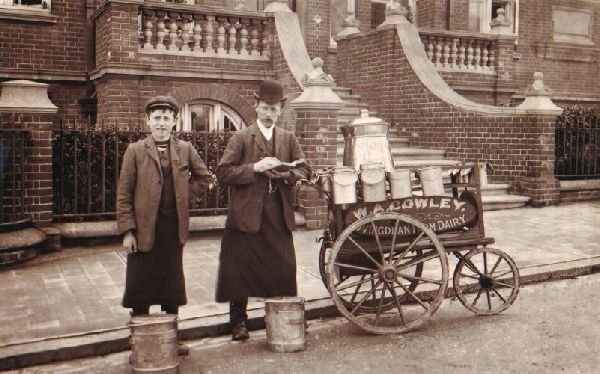 During this time of employment, James delivered cans of milk to pubs between the districts of Chelsea and Kensington. James in his memoir reflects on how his days were long, as he had to travel back and forth to the dairy to collect milk for delivery ‘back to the Dairy again for further cans of milk, to take to other pubs in an opposite direction’ (20A). James shares his experiences with many working-class individuals, as like them he was perceived as unskilled and only useful to fulfil laborious roles. 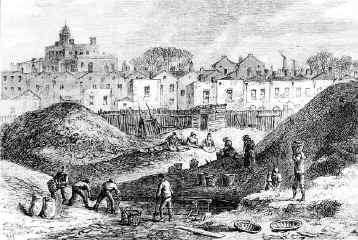 John Burnett investigates this idea in Useful Toil, in which he argues that occupations were defined by a hierarchy of skill: ‘fetching and carrying, mixing up materials, doing the rough, preparatory work and other jobs for which muscle, rather than skill, was the main requirement’ (52). James in his memoir never states whether he was paid a wage for his work as a cow-keeper, which could suggest that while working for his uncle, any money that he may have received went towards his keep. There is a sense that James was taken advantage of by his uncle, as most days he would have to work a 16-hour day, ‘in the evening washing up the cans … finishing at night about 8.pm from 4.am’ (21A). James acknowledges that he did not have much choice, as he was always wary of the punishment that his uncle would execute if he did not complete his tasks correctly ‘one morning I upset the two cans of milk with the result, I found out that my uncle was cruel, he had a usage of punishment’ (21A). Above is an example of a milk trolley. James during his time as a cow-keeper/milk distributor would have pushed a trolley similar to this to deliver milk to pubs across the Chelsea and Kensington district. Although James portrays his first experience of employment as a challenging moment in his life, he looks towards the positive impacts that his job had on him. Through his role as a cow-keeper, James encountered different people and found new friends. One friend, he talks about in great fondness, as through him he was introduced to a world of entertainment ‘If we could finish early, my companion took me to a music hall, the Old Sun at Knightsbridge’ (21A). Here, there is a sense that James’ only escape from the hardship of his life was through seeing entertainment. These moments in his memoir foreshadow how the decision to run away and embrace the wanderlust was a decision made without much thought, as only through being involved with entertainment was James liberated from the presence of his uncle. James further explores how seeing a circus during his time with his uncle gave him the clarity to decide what he wanted to do with his life ‘It was showmanship if it was! … after seeing such a grand show, my resolution was fixed to run away!’ (25A). James’ words acknowledge how anything compared to life with his uncle was worth taking the risk, as only through leaving the company of his uncle would he be able to find new independence in himself and his work life. ‘I strolled into one of the brickfields, and saw them making bricks, when a man said to me “do you want a job kid”, I naturally said yes’ (49). James in his memoir states that the brickfields where he worked was on mud lane in Shephards Bush. Following the events of the circus show, James recalls the arrest of his uncle and the trial and tribulations that he faced in next months. James after an intervention of being imprisoned for falsely being identified as a thief, is taken to the home of his ‘poor aunt’. During this period, he details his first independent venture in a career on a brick field. At this moment in his life, James gets the sense of a community within the work environment, as he is treated well and cared for by the other workers, ‘the men made a collection of coppers for me to ride home, when I got there that evening I told my aunt that I had started work in a brick field’ (50). James recollects his past with a sense of pride, as even at a young age after the ordeals he has faced, he still appreciates the opportunity to learn a skill and gain a wage for himself. The wage he received not only gave him a new sense of independence, but it allowed him to afford his keep and not become a burden for his aunt and uncle, ‘I worked the week through, and I drew my first wages eight shilling … happily I put into my aunts hand the eight shilling’ (51). Here, it is apparent that James puts the care of others before himself, as his intentions show maturity and thoughtfulness: aspects of his character that will benefit him once he pursues a career in the circus. James describes that he was ‘very obedient and worked hard’ (51) during his time in the brick field, it becomes clear that James’ commitment to working hard will inform the opportunities that arise and are offered to him during his life. In the second Life & Labour post, I am going to explore how James’ commitment and determination will open doors to his desired career, as he is accepted by the circus and quickly becomes part of their collective family. Burnett, John ed. Useful Toil: Autobiographies of Working People from the 1820s to the 1920s London: Routledge, 1994, pp. 18-60.